How curettage and Kryptonite ® use can be an effective and safe option for the surgical treatment of intraosseous lipoma. Department of Traumatology and Orthopedics, Pontifical Catholic University of Chile’s Hospital, Santiago, Chile. Department of Reconstructive Joint Surgery; Division: Pelvis, Hip and Thigh. Dr. Sotero del Rio Hospital. Marcoleta 352, 2nd Floor, Santiago, Metropolitan Region. Chile, Postal Code: 8330033. Introduction: Intraosseous lipomas are the most infrequent primary bone tumor, lesions are mainly asymptomatic and generally diagnosed incidentally, and there is controversy about the management. Here, we present a surgery solution that has not been described previously in literature. 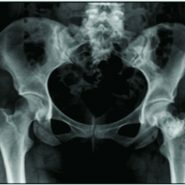 Case Presentation: A 23-year-old female without previous morbid history consults a general physician because of unspecific left hip pain when walking, not related to any previous trauma or any other symptoms. In her study, radiography of the sore hip showed a radiopaque lesion with lithic aspect at the neck of the left femur. Conclusion: Intraosseous lipoma, in spite of being a rare condition, can be diagnosed incidentally by its radiologic characteristics. The treatment can be based on observation or surgery in particular cases objectified by clinic and Mirel score. Keywords: Intraosseous lipoma, bone tumor, Mirel score, kryptonite. Intraosseous lipomas are the most infrequent primary bone tumors, they represent less than 0.1% of all bone tumors and are generally diagnosed between fourth and fifth decades of life . The most frequent localization is large bone metaphysis, mainly low extremities (34% proximal femur, 8% calcaneus, 8% ilium etc.) [1-4]. Lesions are mainly asymptomatic and generally diagnosed incidentally. Radiologic diagnosis has a big correlation with histopathological study, because of highly specific characteristics found at radiography (Rx) and magnetic resonance imaging (MRI) [1-5]. There is controversy about the management , there is no consensus between surgery (curettage, biopsy and allograft) or observation, taking into account that most of the cases are asymptomatic or had rather low functional repercussion with low malignancy potential [1, 6]. Here, we present a rare case of a young female patient with an intraosseous lipoma in the proximal femur with surgery resolution. A 23-year-old female without previous morbid history consults a general practice physician because of unspecific left hip pain when walking, not related to any previous trauma or any other symptoms. She was referred to traumatology where she was evaluated and no pathological findings were present at physical examination. As part of the study, she took an anteroposterior pelvis radiograph (Fig. 1), which detected a radiopaque lesion with a lithic aspect at the neck of the left femur. To complete the study she took a MRI with gadolinium (Fig. 2, 3): showing intraosseous lesions at her left femur neck of 4,1×3, 1×2 cm. each, with well defined, irregular and sclerotic limits, with greater thickness in their medial superior aspect. In the inside, it showed heterogeneous signal of adipose tissue in T1 and T2 without reinforcement when contrast was used and irregular calcifications could be seen in the inside of the lesion (Milgram  stage 3). The case was discussed by the therapeutic team, concluding the need for an intervention because of symptomatic clinic and high risk of pathological bone fracture based on a Mirel score greater than 7  (see table 1). Intraregional curettage was made, samples were sent for biopsy and the defect corrected exclusively with bone cement (Kryptonite®), without requiring any allograft or osteosynthesis (Fig. 3). The biopsy reported a cystic fibrolipomatous lesson, compatible with the radiological finding of intraosseous lipoma with cystic degeneration. The patient had a good clinical evolution and an adequate functional recovery with kinetic therapy. Athough pain persisted but there was significant improvement in pain score at the time of follow up. 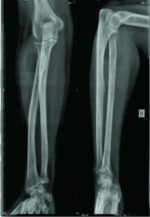 The case represents a rare finding in spite of statistics that reports proximal femur as the most frequent location, because usually there are more calcaneus reports given the major amount of lesions that occur in that area. 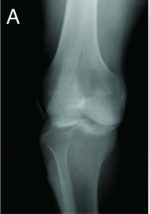 The patient had nonspecific pain (most frequent symptom when any presented), and the initial basic study detected a lesion with radiographic characteristics suggestive of a bone lesion that can be a non-oscificant fibroma, aneurymal bone cyst, simple bone cyst, bone infarct, chondroid tumor, giant cells tumor or intraosseous lipoma [1,4-5]. MRI allows a better radiologic categorization of the lesion as described by Milgram (3) in 1988; stage 1: viable adipocytes, stage 2: partial necrosis with focal calcification and stage 3: extensive tumor necrosis, with multiple cystic zones, calcification and reactive neo-formation bone. Surgical treatment was opted based on symptoms and complementing with Mirel’s score objective evaluation (board 1) used to quantify the risk of fracture in pathological bone. It is worthy to distinguish in this case the use of a new bone cement, recently approved by the FDA in November 2009. Kriptonite® it is a nontoxic triglyceride, bone conductive, calcified, adhesive, cohesive and minimally exothermic. By its characteristics of adhesion, expansion and hardness has properties closer to bone tissue than methacrylate, thus reducing the need for allograft. However, there are not many reports in literature to endorse its use on a big scale. Actually, it is argued and postulated that the pain etiology in these cases could be because of ischemic phenomenon or tumor necrosis in its evolution  and, on the other hand, there are reports of recurrence of pain after surgery. Another proposed mechanism is microtrabecular fractures  after trauma, but there has been no specific researches that correlates them to subsequent fracture. Despite to that described above, in the case of an asymptomatic patient without fracture risk, the clinic and radiographic follow up is a safe alternative [1,5]. Being said this; it is valid to extrapolate risk quantification with Mirel’s score that, in spite of not being described in literature the management on these cases, it is a useful complementary tool when making treatment decision. Intraosseous lipoma, in spite of being a rare condition can be diagnosed incidentally by its radiologic characteristics and the treatment can be based on observation or surgery in particular cases objectified by clinic and Mirel score. The Kriptonite® use in orthopedic surgery must be evaluated as an effective and safe therapeutic alternative for intreaosseous lipoma’s treatment with better outcomes. Diagnosis of intraosseous lipoma can be done incidentally by its radiologic characteristics despite a bad clinical history and common symptoms. Not every intraosseous lipoma needs to be treated, but by using Mirel’s score and followed up, orthopedic surgery becomes an option that needs to be considered. 2. Murphey MD, Carroll JF, Flemming DJ, Pope TL, Gannon FH, Kransdorf MJ. From the archives of the AFIP: benign musculoskeletal lipomatous lesions. Radiographics 2004;24(5):1433-66. 3. Milgram JW. Intraosseous lipomas. A clinicopathologic study of 66 cases. Clin Orthop Relat Res. 1988;(231):277-302. 4. Milgram JW. Intraosseous lipomas: radiologic and pathologic manifestations. Radiology 1988; 167(1):155-160. 5. Mandl P, Mester A, Balint PV. A black hole in a bone — intraosseous lipoma. JRheumatol. 2009;36(2):434-6. 6. Milgram JW. Malignant transformation in bone lipomas. Skeletal Radiol. 1990;19(5):347-352. 7. Mirels H. Metastatic disease in long bones. A proposed scoring system for diagnosing impending pathologic fractures. Clin Orthop Relat Res. 1989;(249):256-64.